This piece is dedicated to Carla Bley, one of my favorite composers. 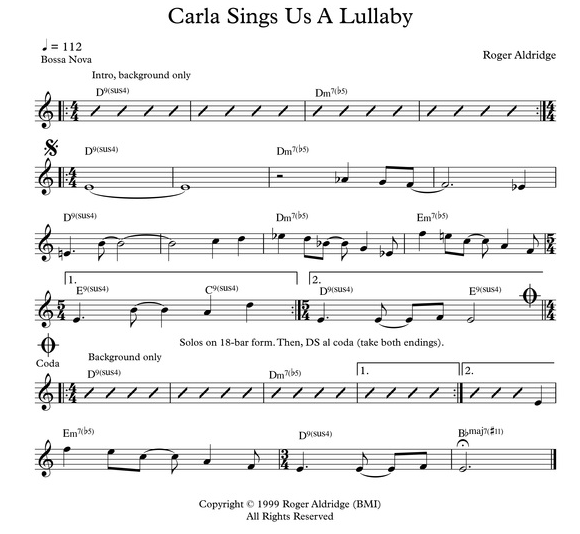 It is an unusual lullaby in how its underlying feeling is a bossa nova. Recorded by Amy Leonard, violin; Jeff Knoettner, piano; E. Shawn Qaissaunee, guitar; and Peter McCarthy, bass. It is a fairly simple tune. Harmonically, it is built around D9 sus4 and Dm7 (b5) chords. I stumbled upon this pattern one day and immediately liked the feeling it creates with its shift in harmonic color (implied Dorian and Locrian modes). This is the only tune of mine that uses it. The measure of 5/4 coming unexpectedly gives a push to the tune's momentum. As I worked on this tune I thought about having another section, but nothing clicked. I came to the conclusion that the music said everything it wanted to say in 18 bars.